Honor students at Bessie Coleman Middle School enjoy a break from the standard school day lunch. CEDAR HILL—It wasn’t your traditional middle school cafeteria setting. 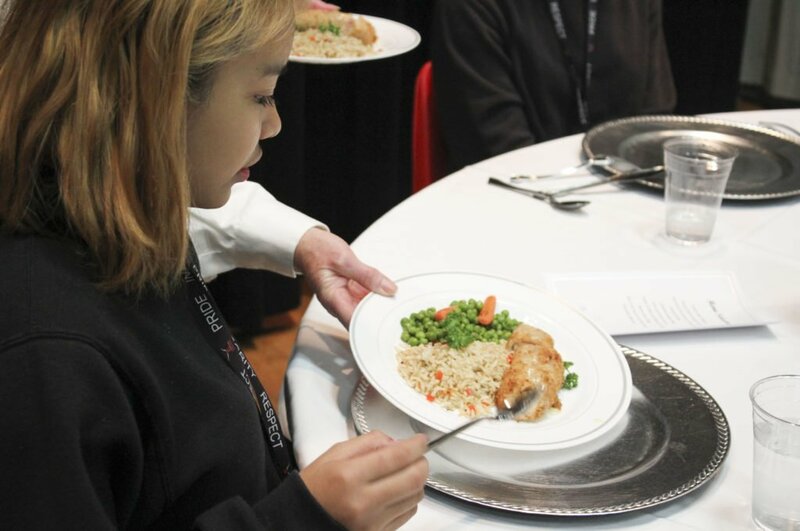 Last week, Cedar Hill middle school students were treated to lunch on white tablecloth with cloth napkins, glassware and table décor. It was truly a fine dining experience. Around thirty honor rolls students in sixth, seventh and eighth grade at Bessie Coleman Middle School in Cedar Hill were treated to this special lunch. While the select group of students were recognized for their good grades, the event held a double meaning. This fine dining hour also afforded student leaders an opportunity to learn proper etiquette and soft skills needed in the workforce. 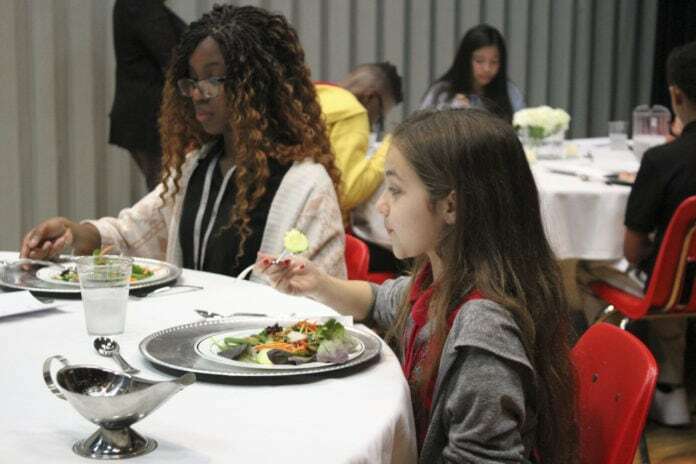 “The dining experience also included a learning experience in the process, which made the day even better,” Bessie Coleman Principal Jason Miller said. The five course meal included: tomato bisque soup, green salad with dressing, lemon sorbet, chicken cordon bleu with green peas and carrots, rice pilaf and bread and a chocolate mousse with strawberries. The meal included tomato bisque, salad, lemon sorbet, chicken cordon bleu with green peas and carrots, rice pilaf and a chocolate mousse with strawberries. Background music played while the boys and girls were served by waitresses wearing white shirts and black ties. Pam Watson, Cedar Hill ISD’s Nutritional Services Director provided etiquette techniques. Watson spoke with the students at length about the importance of sitting up straight, selecting the correct utensil and more. Additionally, the boys even practiced the courtesy of pulling out chairs for the girls. 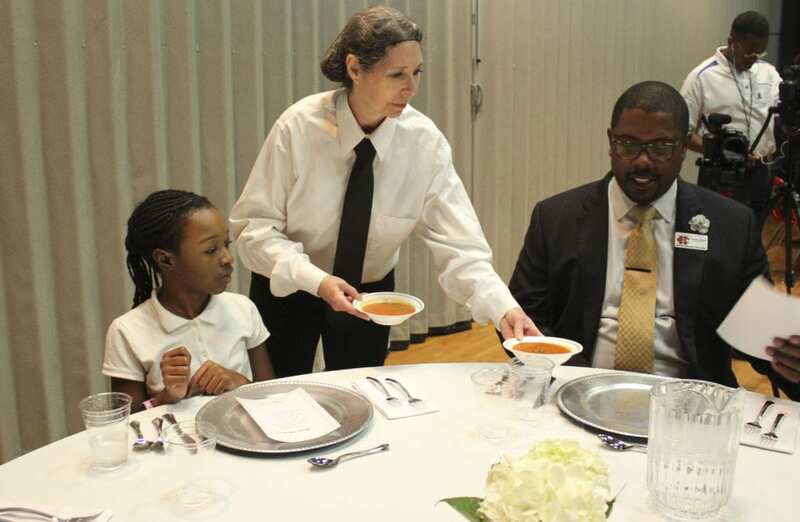 Cedar Hill ISD Superintendent Orlando Riddick joins students in a celebratory fine dining experience. The lunch is done in cooperation with Sodexo, the nutritional services provider for Cedar Hill ISD. More lunch experiences are expected at additional campuses in Cedar Hill in the future. In the meantime, Brown said the district is working out the schedule for the remainder of the year.